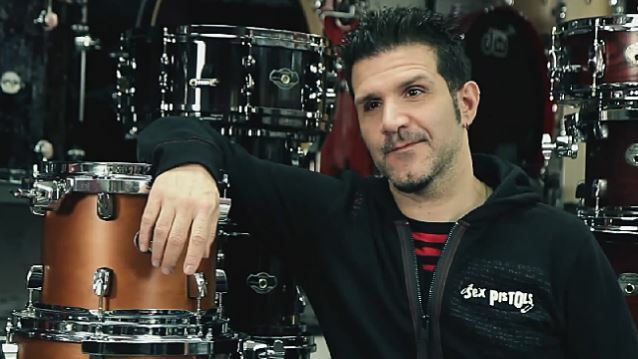 Drummer Charlie Benante (pictured) will miss the first few weeks of ANTHRAX's spring North American tour with VOLBEAT so that he can undergo physical therapy in his continuing battle with carpal tunnel syndrome. He will once again temporarily be replaced by Jon Dette, who has previously played with SLAYER, TESTAMENT and ICED EARTH. "This was a difficult decision to make," Benante said in a statement, "especially as I had to miss dates on the last cycle because of my hand surgery. But the fact is, playing a show five or more times a week just isn't realistic right now. I found that out when we were making our new album, and I don't want to let the fans down by not being able to give it everything I have at every show." He continued: "I was driving the other day and my hand went numb, so unfortunately, it's just not 100 percent yet. I figure I can play for maybe three weeks at a time, but then I have to let it rest." Benante added: "The guys in the band have been incredibly understanding and supportive, and I hope the fans will be as well. The positive side is that I plan to use the time off the road constructively and focus on our upcoming album, continue to work on the package artwork and develop a number of other ideas I've got for the campaign." Benante plans to rejoin ANTHRAX on stage for the band's appearance at the Rock On The Range festival on May 17 in Columbus, Ohio. Dette previously filled in for Benante during ANTHRAX's appearance at the Soundwave festival in 2013 and at a number of European shows in 2014. Jon told "The Blairing Out With Eric Blair Show" how he initially got the call to step in for Charlie: "Actually, Jason Bittner from SHADOWS FALL, who was filling in for Charlie on [the 2012] ANTHRAX run, couldn't do one of the tours that was coming up and called me and asked me if I would be available to do it. And I said, 'Of course. It would be great.' And the next day Charlie called me — which, Charlie is one my biggest influences ever, next to [Dave] Lombardo [of SLAYER], so it was kind of a surreal moment for me to get a call like that, saying, 'Hey, can you help me out?' Which, of course, I said, 'Absolutely.'"